Publisher: A. Zwemmer Limited. Country: United Kingdom. Date: 1966-73. Co-publisher: A. S. Barnes & Co. Country: United States. London, A. Zwemmer, 1968 (The International Film Guide Series). Paperback. Illustrated with black and white photos. Entries are arranged alphabetically. Index to about 5,000 flims. Size: 12mo. 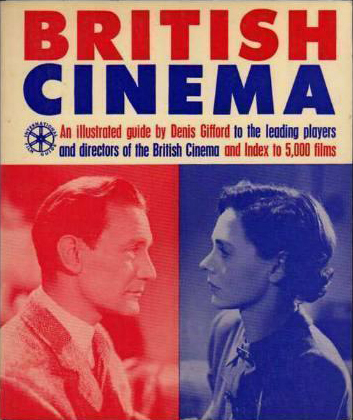 The front cover features Trevor Howard and Celia Johnson in the film Brief Encounter. The back cover features Charles Laughton in The Private Life of Henry VIII and a close-up of Julie Christie. "The International Film Guide Series (...) continues its diligent and heartfelt excursion into the past" -- The San Francisco Examiner, 20 June 1971, p. 164. "...by and large an excellent set of small-format books on various genres, film makers and stars" -- The Atlanta Constitution, 21 June 1970, p. 73. "Ideal for fans and researchers" -- The Los Angeles Times, 2 January 1968, p. 63. The Animated Film - Ralph Stephenson. Antonioni, Bergman, Resnais - Peter Cowie. British Cinema: An Illustrated Guide - Dennis Gifford. Buster Keaton - J -P Lebel. Chaplin, Lloyd, Keaton, Langdon - Donald W McCaffrey. The Cinema of Alain Resnais - Roy Armes. The Cinema of Carl Dreyer - Tom Milne. The Cinema of John Frankenheimer - Gerald Pratley. The Cinema of François Truffaut - Graham Petrie. The Cinema of Fritz Lang - Paul M. Jensen. The Cinema of John Ford - John Baxter. The Cinema of Josef von Sternberg - John Baxter. The Cinema of Joseph Losey - James Leahy. The Cinema of Luis Bunuel - Freddy Buache; Peter Graham. The Cinema of Roman Polanski - Ivan Butler. The Cinema of Otto Preminger - Gerard Pratley. A Dictionary of the Cinema - Peter Graham. Early American Cinema - Anthony Slide and Paul O'Dell. Early American Film - Anthony Slide and Paul O'Dell. 4 Great Comedians : Chaplin, Lloyd, Keaton, Langdon - Donald W McCaffrey. Griffith and the Rise of Hollywood - Paul O'Dell; Anthony Slide. Hitchcock's Films - Robin Wood. Peter Cowie, ed. Hollywood in the Fifties - Gordon Gow. Hollywood in the Forties - Charles Higham; Joel Greenberg. Hollywood in the Thirties - John Baxter. Hollywood in the Twenties - David Robinson. Hollywood in the Sixties - John Baxter. Hollywood Today - Pat Billings and Allen Eyles. The Horror Film - Ivan Butler. Also published as: Horror in the Cinema. 2nd revised edition. by Ivan Butler. International Film Guide - Roy Armes. International Film Guide - Peter Cowie. The Marx Brothers: Their World of Comedy - Allen Eyles. The Music Film - Douglas McVay. Religion in the Cinema - Ivan Butler. Science Fiction in the Cinema: 1895-1970 - John Baxter. Suspense in the Cinema - Gordon Gow. Swedish Cinema - Peter Cowie. Ustinov In Focus - Tony Thomas. The Western: An Illustrated Guide - Allen Eyles.